We are relieved that Broomall’s Dam withstood Hurricane Sandy last week, but thought we should share what we learned about the condition of the dam at our Dam Safety Workshop on August 20, 2012. The Friends of Glen Providence Park sponsored a Dam Safety Tour at Broomall’s Dam with Richard Reisinger, district chief of the Division of Dam Safety for the PA Department of Environmental Protection (PA DEP). In attendance were over 30 citizens and Delaware County and Media Borough officials, including the Media Chief of Police, Martin Wusinich and Delaware County Manager of Environmental Planning, Karen Holm. While invited, it is not clear whether the Broomall’s Lake Country Club sent a representative. 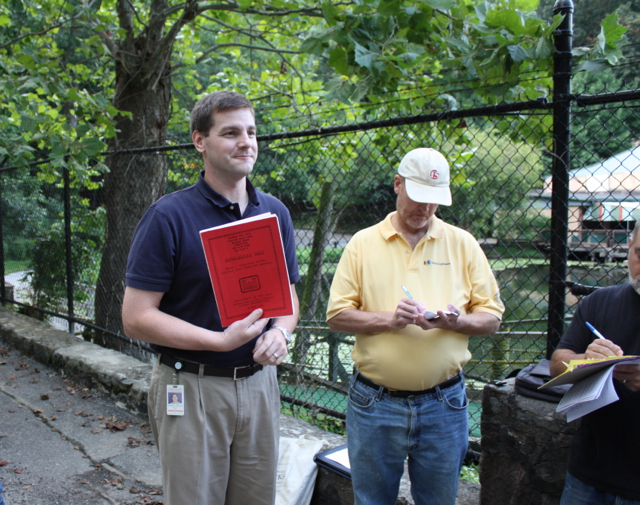 Mr. Reisinger reviewed the history of Broomall’s Dam, the current status, safety issues and emergency planning, and he graciously fielded many questions. Of the 3300 dams in PA, 780 are high hazard dams, which means that in the event of dam failure, permanent structures and human life are at risk. 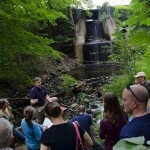 Broomall’s Dam is a high hazard dam and will always be, even when rebuilt. These drainage issues create a situation where there is a risk that the lake water could overtop the dam in a heavy rain event. When water overtops a dam, there is a very real threat of failure. Mr. Reisinger said that Broomall’s Dam could fail at any time, however dam failure would most likely result from a 100 year rain event such as 20 inches of rain in a 24-hour period. 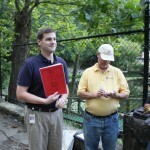 Upon inspection on the day of the Dam Safety Workshop in August, Mr. Reisinger indicated that the lake was not in drawdown, since there was water coming over the top of the spillway. In addition, there is no Emergency Action Plan filed for the current Broomall’s Dam, which may reflect the various parties’ historical reluctance to acknowledge ownership. Mr. Reisinger assured the attendees that municipal, county and PA DEP officials keep a close eye on the dam, and if there was an imminent threat of failure, these authorities would work together to make sure people were properly evacuated. The New Dam: Smooth sailing? Many documents will need to be filed to get a new Dam Permit approved with the PA DEP, says Reisinger. He acknowledged that the PA DEP is bound to follow the Stipulation Agreement, and as such will look to Delaware County and Broomall’s Lake Swim Club when it comes time for an Emergency Action Plan, maintenance, inspections and operations. A dam permit will not be issued without an Emergency Action Plan, environmental, safety and historical reviews, as well as an opportunity for public comment for 30 days after the project is posted by the PA DEP. Mr. Reisinger indicated that further signed documents might be necessary to properly establish the management agreement for the dam between Delaware County and Broomall’s Lake Country Club. It is not clear whether a signature on the Dam Permit will make the signatory the owner. Even Mr. Reisinger was unclear on that. The three parties to the stipulation have seemingly been avoiding the term “ownership” in favor of responsibility. However, Mr. Reisinger stated that anyone who has their “fingerprints” on the dam will be liable in the event of a failure. Mr. Reisinger encouraged questions and seems supportive of a public comment period during the PA DEP review process. Friends of Glen Providence Park thanks him for taking the time to speak with the community directly. The Friends of Glen Providence Park will continue to follow and share all issues related to the construction, permitting and Emergency Action Plan for the proposed dam.